The east side of Toronto’s core is going to be experiencing some big changes! Earlier this year I wrote about development happening east of Yonge… but there’s so much happening it deserves another look. The National Post spoke with a number of developers and recently published an interesting piece on what’s happening in the neighbourhood which has yet to be named. The projects sound interesting and the good news is that at least one of the towers will be incorporating heritage buildings. SigNature Communities is planning a building called East United which would be at Berkeley and Adelaide. The 21 storey building would keep the Christie Brown & Co. stables which were built in 1906. 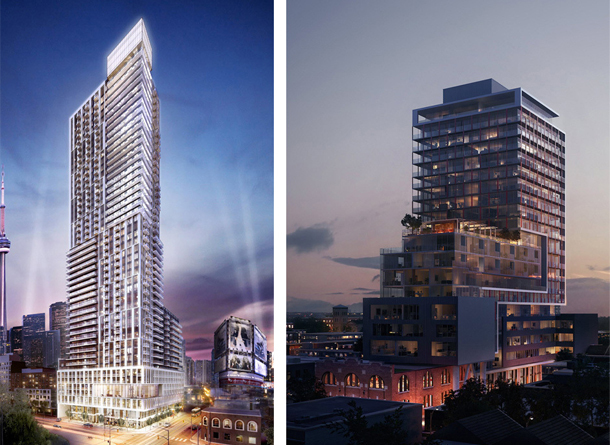 CentreCourt Developments has a 47 storey tower planned for Dundas and Jarvis, Grid Condos.